We expected more from the Sgt Pepper album, but perhaps he is waiting for the anniversary album to appear. Another surprise is the non-inclusion of "Band On The Run", that hasn't happened before.. 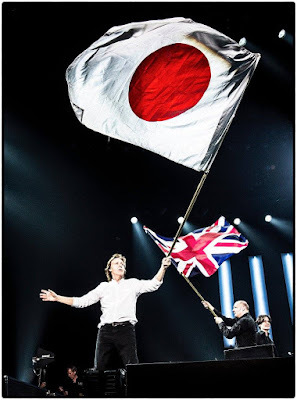 It is a shorter set list than usual, but McCartney played a shorter set last time he visited the Budokan Hall too, so perhaps those "missing" songs will reappear later on in the tour. Meanwhile, Paul has added a massive new run of U.S. dates to his One On One tour. An official announcement from Paul is expected today, but eager local promoters have already started to announce the concerts, like this one. Also rumoured for later in October: South America. 14 - Being For The Benefit of Mr. Kite! Budokan has always been a shortened set list, so 31 songs for there sounds about right.